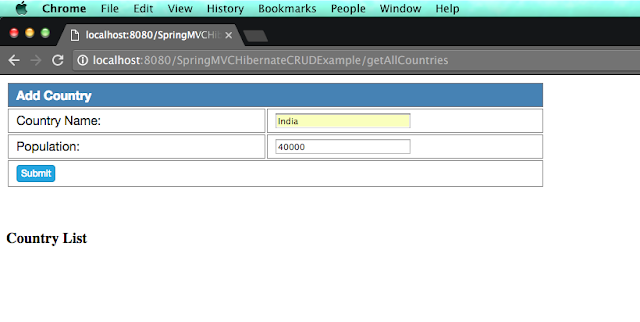 In this post, we are going to see integration of Spring MVC,Spring Data,hibernate and mysql CRUD example. We have already seen Spring MVC, hibernate and mysql example in previous tutorial. Spring Data JPA provides CRUD API, so you don’t have to write boiler plate code. You just need to create repository interface and spring will provide implementation automatically. 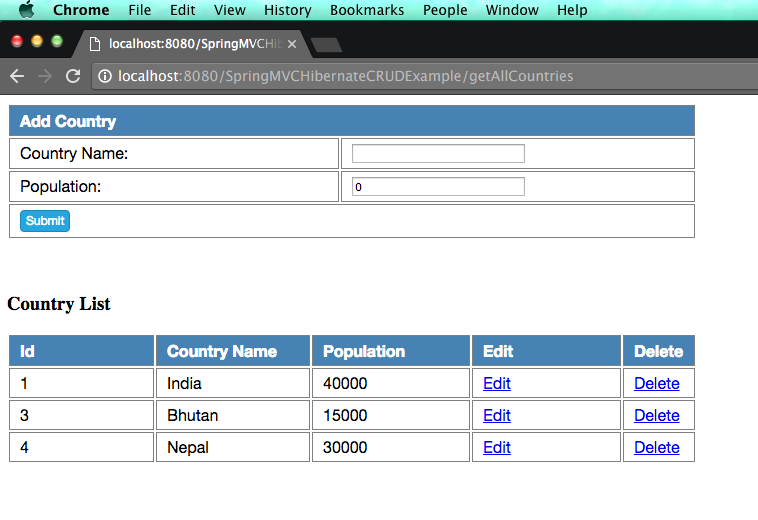 Here are steps to create a project with Spring MVC , Spring data, hibernate and mySQL crud example. 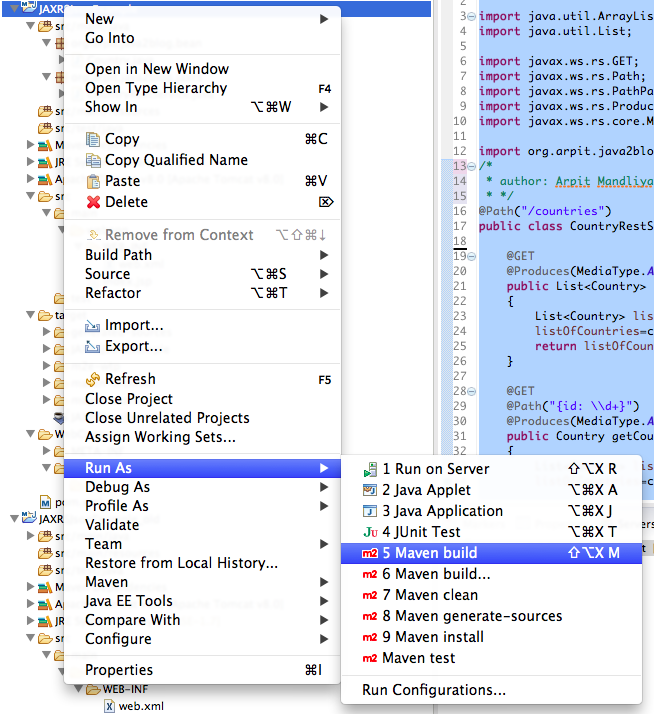 2) We will use Spring 4 and hibernate 4 for this project. 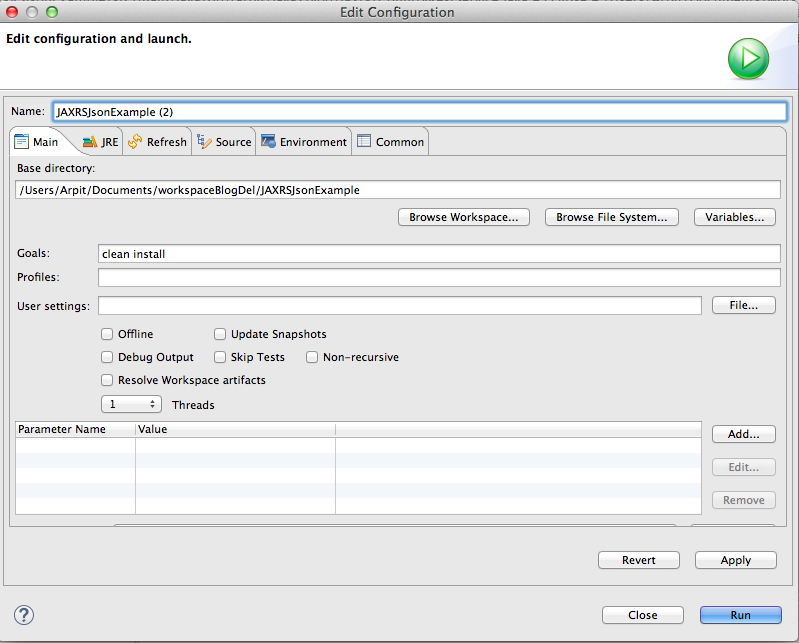 4) create a xml file named spring-servlet.xml in /WEB-INF/ folder. 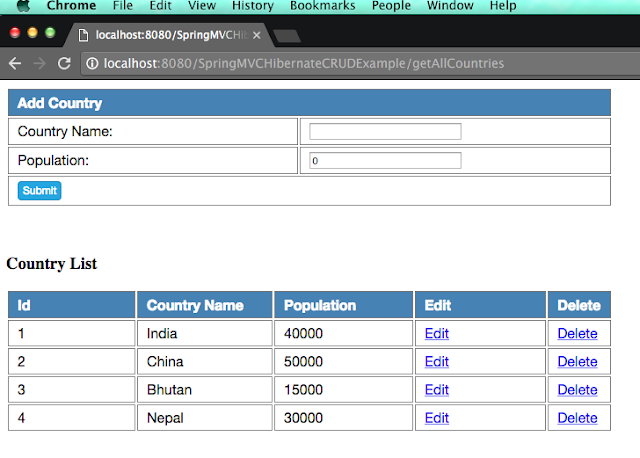 In Spring-servlet.xml, we have done hibernate and spring data configuration. dataSource bean is used to specify java data source. We need to provide driver, URL , Username and Password. 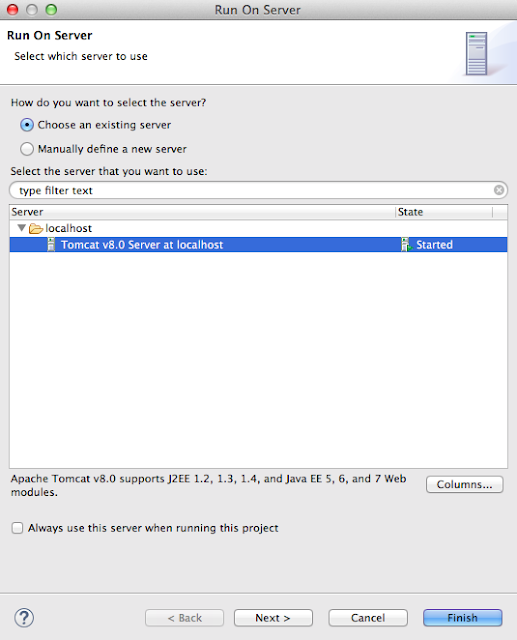 transactionManager bean is used to configure hibernate transaction manager. Create a applicationcontext.xml in WEB-INF folder, this file is used for bean configuration as we are using spring-servlet.xml for bean configuration , we will keep this file empty. 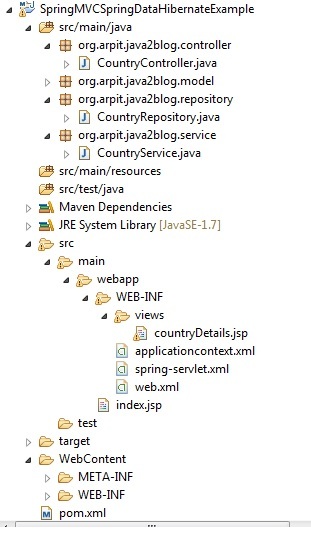 Create a interface called CountryRepository.java in package org.arpit.java2blog.repository. You don’t have to provide implementation of this interface. 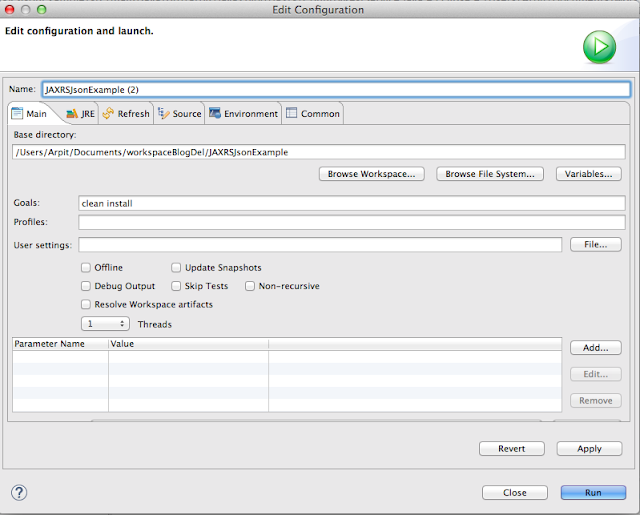 Spring automatically provides implementation of common methods such as save, delete , findOne once you extends to CrudRepository Interface. CrudRepository has two generic argument. Country: It is for what type of entity you are going to save in database. Integer : It is datatype of identifier for entity object. It is service level class. It will call DAO layer class. @Service is specialised component annotation which is used to create bean at Service layer. Create view called countryDetails.jsp in WEB-INF/view/ folder. 8) It ‘s time to do maven build. 11) Now lets hit below URL to getAllCountries. As you can see, we did not add any country to the list, so it is empty. Lets add Country named India to country list and click submit. 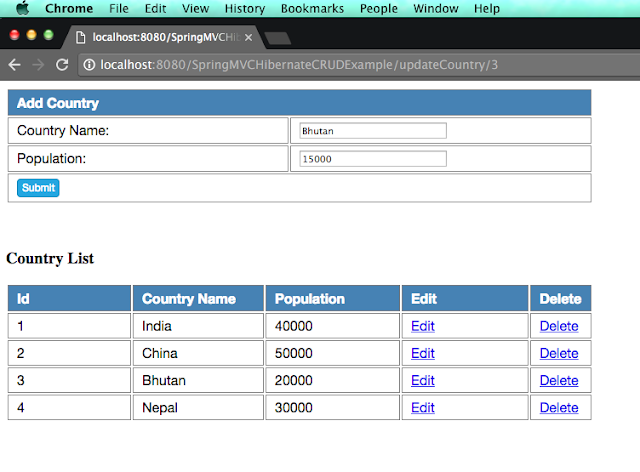 Similarly we will add China , Bhutan and Nepal respectively and you will see below screen. Lets edit population of Bhutan to 15000. Click on edit button corresponds to Bhutan. When you click on submit, you will get below screen. Lets delete country China from above list, click on delete button corresponds to 2nd row. As you can see, china got deleted from above list. We are done with Spring MVC, Spring data hibernate MySQL CRUD example. If you are still facing any issue, please comment.